Cross-bedding in the Jurassic Entrada Sandstone. 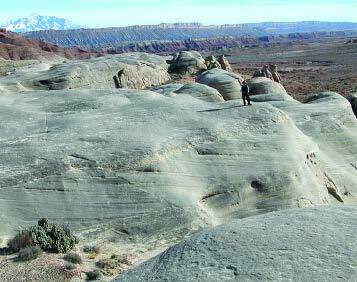 The eolian dune deposits of the Entrada are an important gas reservoir in the southern Uinta Basin. Photo by Thomas Morris, Brigham Young University. The Utah Geological Survey (UGS) started a new program in 2004, titled “Characterization of Utah’s Hydrocarbon Reservoirs and Potential New Reserves.” This program uses mineral lease funds to support geologic research to help improve the characterization of Utah’s hydrocarbon reservoirs primarily at the play level, but also at larger scales (for example, field, basin, or province). The goal of this research is to fulfill one or more of the following: (1) improve the state’s assessment of its hydrocarbon reserves and future hydrocarbon resource potential, (2) identify reservoir features, untapped compartments, or recovery techniques to encourage more effective exploitation of proven reserves, and (3) improve the understanding of the play’s depositional history, trapping mechanism, source rocks, and generation/migration of hydrocarbons to encourage exploration for new or untapped hydrocarbon reserves. The final reports of the research become public domain and will be released as UGS Open-File Reports. The U.S. Energy Information Administration projects that the U.S. demand for natural gas will grow at an average rate of 2 percent per year for the next 20 years. Utah will play a vital role, along with other Rocky Mountain states, in meeting that demand. The Rocky Mountain region now provides 20 percent of our nation’s natural gas according to the University of Utah, Bureau of Economic and Business Research. Utah has produced natural gas since 1891, but low prices, a lack of a national market for Rocky Mountain gas, and expensive drilling have resulted in slow development of the state’s natural gas resource. The 21st Century, however, has brought dramatic changes to Utah and other Rocky Mountain gas-producing states. A major shift to cleaner burning natural gas has occurred in industrial and manufacturing use, and generation of electricity. As a result, there has been a significant increase in demand for natural gas and an associated increase in price. New pipelines have been constructed to transport Rocky Mountain gas out of the region, bringing more competitive national pricing to Utah’s natural gas. Drilling and production from under-developed gas plays and exploration for new plays, both conventional and unconventional, will result in a significant financial contribution to Utah’s economy for many decades to come. The University of Utah, David Eccles School of Business, Bureau of Economic and Business Research reported that nearly $140 million in royalties and severance tax was paid on Utah’s natural gas production in 2001. Utah’s total petroleum consumption is at an all-time high, but crude oil production in the state is at a 45-year low. In 2004, the state produced less than 15 million barrels of oil, down from a high in 1985 of more than 40 million barrels. Even with the decline in production, however, oil continues to be a vital part of the economy of the state and many of the counties, especially with oil selling for around $60 per barrel. Many of the oil fields in the Uinta Basin are beginning water-flood operations that will help maintain production for many years. Also, the newly discovered Covenant field in Sevier County has spurred additional wildcat drilling in the central Utah area which could lead to many new discoveries (see related article in Survey Notes, 2005, v. 37, no. 2). Mesaverde Gas of Southeastern Uinta Basin, by Paul B. Anderson, consulting geologist, Salt Lake City, Utah. Open-File Report 460. Defining and Characterizing Mesaverde and Mancos Sandstone Reservoirs Based on Interpretation of Formation MicroImager (FMI) Logs, Eastern Uinta Basin, Utah, by Mark W. Longman, consulting geologist, Lakewood, Colorado, and Randolph J. Koepsell, Schlumberger Oilfield Services, Greenwood Village, Colorado. EOG Resources, Kerr-McGee, Questar, and Schlumberger Corporations (Colorado) contributed to the project. Open-File Report 458. A Multidisciplinary Approach to Reservoir Characterization of the Entrada Erg-Margin Gas Play, Utah, by Thomas H. Morris, John H. McBride, and Willl D. Monn, Brigham Young University, Provo, Utah. Open-File Report 459. Shale-Gas Reservoirs of Utah: Survey of an Unexploited Potential Energy Resource, by Steven Schamel, GeoX Consulting Inc., Salt Lake City, Utah. Open-File Report 461. Reservoir Characterization in the Jurassic Navajo Sandstone, Snow Canyon State Park, Utah, by Marjorie Chan and Gregory Nielsen, University of Utah, Salt Lake City, Utah. Integrated Sequence Stratigraphy and Geochemical Resource Characterization of the Lower Mancos Shale, Uinta Basin, Utah, by Donna Anderson and Nicholas Harris, Colorado School of Mines, Golden, Colorado. Reservoir Characterization of the Cretaceous Cedar Mountain and Dakota Formations, Southern Uinta Basin, by Brian Currie, University of Miami, Oxford, Ohio, and Mary McPherson, McPherson Geologic Consulting, Vernal, Utah.